Today I wanted to share with you one of my favorite dresses we have in the Rachel Parcell Collection right now! I love that this piece can be worn in the warmer months of the year and also during the middle of winter. The Polka Dot Tie Dress is so flirty and has such a cute feminine shape! It has the perfect tie that wraps around your waist and it makes it fit so amazing on ALL body types. I have also had so many questions about these new Schutz heels that I wore the other day, that I wanted to share them with you again. They are so classic and went perfectly with this outfit! 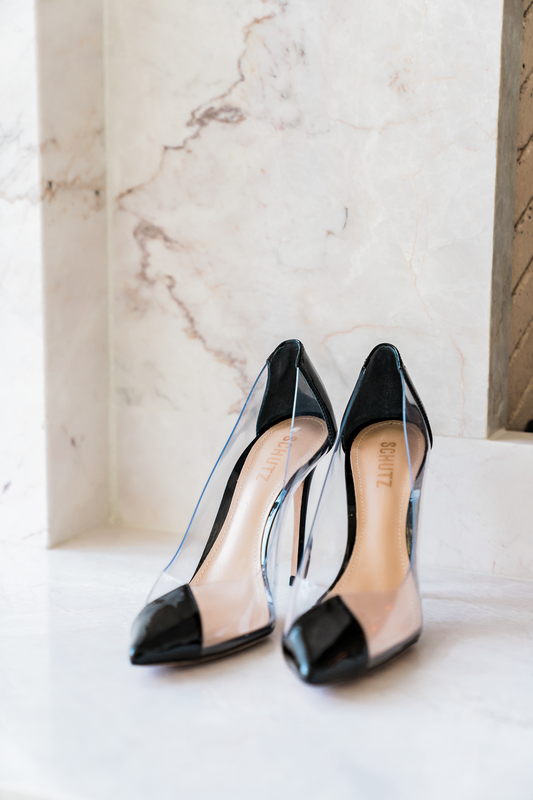 They are the perfect twist on a classic black pump and are UNDER $150.00! They can totally be worn with a dressy outfit or a casual one. I really loved that this look felt very edgy, but super feminine and classic all at the same time. Love ♥️ this cute polkadot looks for the day, parfait and suited for an office look or A day’s out! It’s a lovely dress and it looks great styled with the classic white coat like you wore it. Such an elegant look. So in love with this dress, SO cute! And love your hair worn up like that with it – so pretty! I love wearing dresses in the winter but i get so tired of bLack tigHts. Do you recommend bare legs or Wearing nylons? That dress is stunning! I also am in absolute love with the reflection of the mountains in the glass doors. I haven’t checked in for awhile, and clearly i have some catching up to do on your blog! We have an online warehouse sale going on right now and this dress is on sale! It’s on sale right now! Check out our online warehouse sale for other fabulous offers! It’s a perfect look, I like your dress babe! Nice choice. Thank you! It’s on sale right now! I love polka dots and you look great! Hi, My name is Hormony, your blog is awesome, nice content and beautiful pic it’s much impressive. I love this look! It reminds me of your signature from a few years back… feminine with a chic edge. i think that was what drew me to follow you 5 years ago. you have such a talent for mixing looks to create something unique. Thanks for the inspiration! I’m loving this dress Rachel! The polka dots are super cute and ruffle detail is perfect! Loving how you ‘ve styled it here.